Yeah, I know what Jamie's feeling here. I think every artist does. Sometimes, a project just doesn't work for someone. It happens. 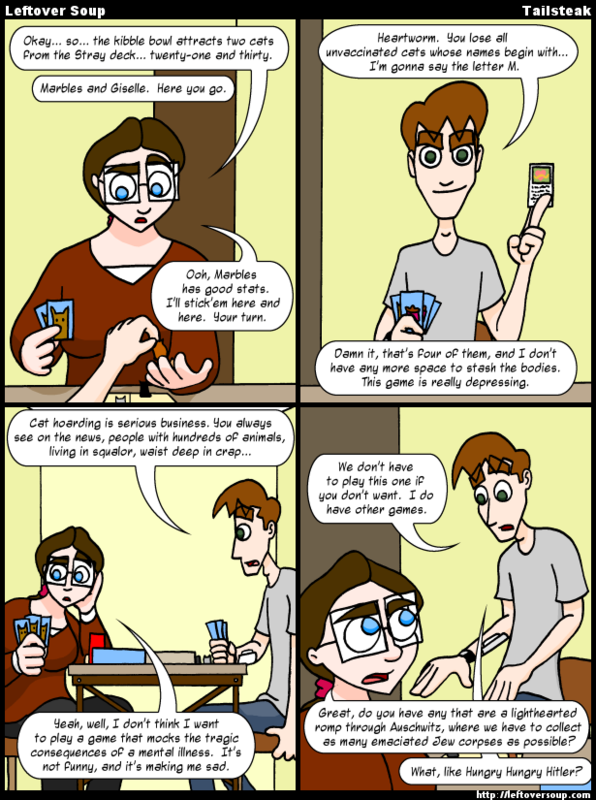 On an unrelated note, I like Jamie's "You've just activated my trap card" face in panel 2, there. I don't know what it is with him and looking good in panel 2. EB: Okay... so... the kibble bowl attracts two cats from the Stray deck... twenty-one and thirty. JH: Marbles and Giselle. Here you go. EB: Ooh, Marbles has good stats. I'll stick'em here and here. Your turn. JH: Heartworm. You lose all unvaccinated cats whose names begin with... I'm gonna say the letter M.
EB: Damn it, that's four of them, and I don't have any more space to stash the bodies. This game is really depressing. EB: Yeah, well, I don't think I want to play a game that mocks the tragic consequences of a mental illness. It's not funny, and it's making me sad. JH: We don't have to play this one if you don't want. I do have other games. EB: Great, do you have any that are a lighthearted romp through Auschwitz, where we have to collect as many emaciated Jew corpses as possible? JH: What, like Hungry Hungry Hitler?